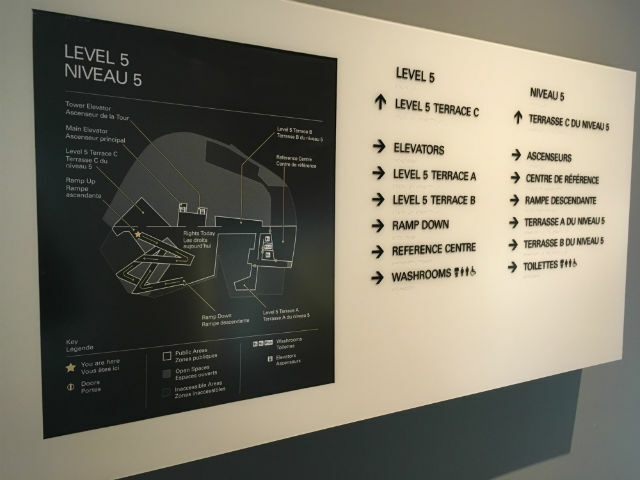 From the building’s inception, CMHR was committed to creating a good, comprehensive wayfinding system. 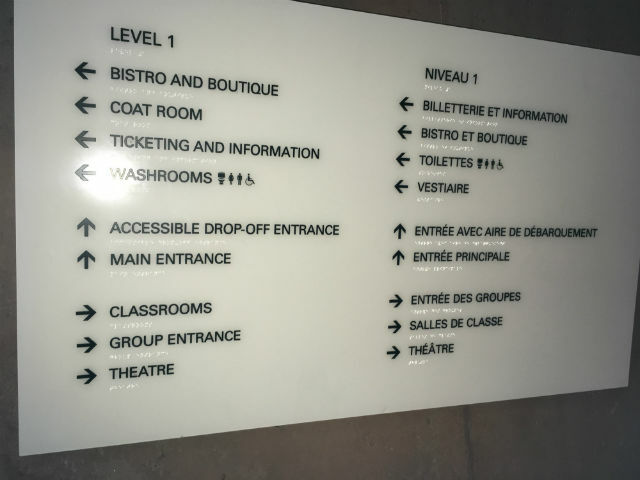 A clear, comprehensive wayfinding system is essential to enable Museum visitors of all ages and abilities to navigate their way through this architecturally beautiful, unique and symbolic building. Wayfinding is not just an elaborate term for signage. In its simplest definition, wayfinding is “The act of finding one’s way to a particular place” (Oxford English Dictionary). In essence, wayfinding is the act of navigation: It is knowing your point of origin and your destination, following a good route from your origin to your destination, recognizing you’ve arrived at your destination and then finding your way back to your point of origin. A wayfinding system is very important to help people navigate through a built environment. A good system is particularly important to help people find their way in complex architectural environments such as the CMHR building. It responds to all of the visitor characteristics (age, mobility, gender, etc. ), is geared to first-time visitors or those who are unfamiliar with the building, and offers a variety of redundant wayfinding cues (signs, maps, spoken directions, technology, etc.). The components of a good wayfinding system can be grouped into two categories: design and operational elements. The CMHR has tried to use as many elements from both categories as possible. The three main building entrances – Main Entrance, Group Entrance and the Accessible Drop-Off Entrance – are identified by large ground-mounted pylon signs at the foot of the pathway to each entrance. These signs are readily visible to pedestrians and vehicles alike. Each of these signs illuminates at night to ensure effective visibility. The lettering on each sign is in white, set against a dark field background to give high contrast visibility (see Figure 3.8.1). Numerous YAH maps are provided throughout the Museum to provide spatial orientation for unfamiliar visitors. They have been strategically placed in view of directional decision points such as elevators and ramps. Bilingual signs layout: Copy for both English and French messages is blocked together (rather than English copy followed directly by French copy). This makes the messaging easier to follow. 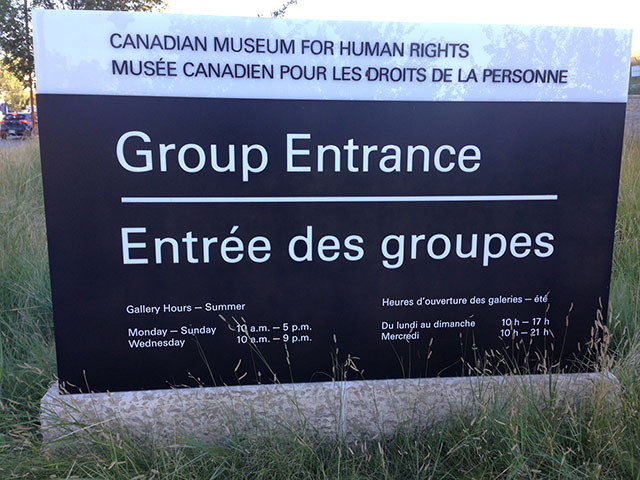 Message layouts and arrows: Messages on directional signs for destinations in a single direction (e.g., to the left) are organized by directional grouping (and notated with the appropriate directional arrow), and are alphabetized within each group, regardless of the type of destination (washroom, exhibit, etc.). This allows for, at most, three groupings of directional messages (left, straight ahead and to the right) and makes messages easier to read. Tactile letters, upper instead of lower case letters, Braille and content: All directional signs are tactile and in upper case only. (Anecdotal information suggests that upper case tactile lettering is easier and quicker to read.) All tactile letters are also slightly beveled on their edges, contributing to ease of reading for people who read by touch. In addition to tactile lettering, Braille has also been incorporated on all directional signs, which is also a requirement of the Manitoba Building Code. As recommended by accessibility consultants, the Braille used is at Grade 1 level, in both English and French. Floor levels, washrooms, elevators and ramps were deemed as critical information for visitors. Thus, all signs including this information are both tactile and in Braille. Degree of colour contrast on signs: All wayfinding signage follows the guideline of at least 90% contrast between the text and the background. This assists all visitors, including those with low vision, by making the signs easier to read. 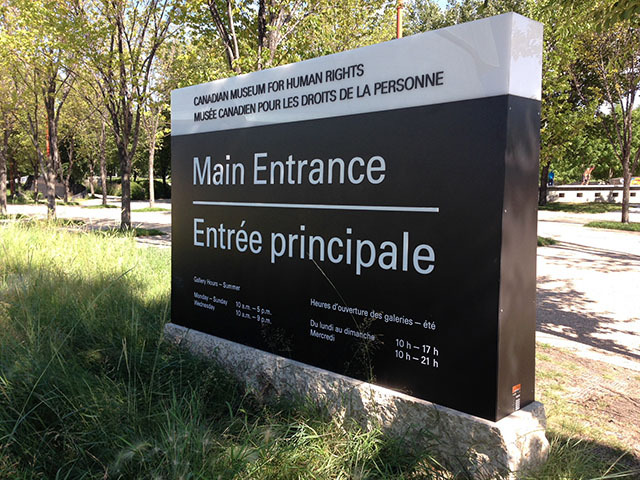 Symbols on signs: Use of symbols on wayfinding signs is limited to only the most internationally recognizable signs – the ISA (International Symbol of Accessibility), men and women’s washrooms, and infant change tables. Location: The location of wayfinding signage is consistent throughout the building, i.e. it has generally been placed on the right-hand side (direction of flow) of walls. The placement height of the signs is within the reach range of most people. Mockups and testing: Prior to signage fabrication and installation, numerous sign mockups/prototypes were created and reviewed for effectiveness and usability by various users. When we add new wayfinding signage, we create mockups and often critique or test to ensure maximum functional effectiveness for all visitors. Our wayfinding needs will continue to evolve as the functions of our facility evolve; this is an important component to ensuring continued success of a wayfinding system. All three major entrances, as well as the entire facility, are accessible to people with disabilities and to wheelchairs. There is an Accessible Drop-Off Entrance where people can be dropped off right at the building’s entrance. Also at this entrance are four parking stalls designated only for vehicles that display a valid provincial parking permit for people with disabilities. There are accessible washrooms on every floor. There are accessible water fountains on most floors. There is an accessible payphone and ATM, both are on Level 1 and both are TTY capable. See the Visitor Supports section of this guide for additional accessible design provisions for our visitors. Wayfinding operational elements are organizational policies and practices related to wayfinding. Visitors may download self-guided tour itineraries from the CMHR website before their visit. Visitors can use the mobile application to develop their own visit plan. When visitors arrive, staff and/or volunteers are available to help them plan their tour itinerary. They may choose from guided or self-guided tour options. The visitor planning service ensures that visitors’ needs are met, taking into account the amount of time they have, what interests them, circulation options, use of ramps or elevators, etc. We also solicit ongoing visitor feedback (surveys, interviews, etc.) to ensure that we are always making improvements. Wayfinding information is provided on both the Museum’s website and mobile application. This allows the visitor to plan their visit in advance or as they venture through the Museum. Both platforms provide information on inclusive wayfinding features at CMHR.